Indie Pop a.k.a. Indie-Pop is a record label. Indie pop is a genre of alternative rock music that originated in the United Kingdom in the mid-1980s, with its roots in Scottish post-punk bands on the Postcard Records label in the early 1980s and the dominant UK independent band of the mid-1980s, The Smiths. Indie pop was inspired by punk&apos;s DIY ethic and related ideologies, and it generated a thriving fanzine, label, and club and gig circuit. Indie pop differs from indie rock to the extent that it is more melodic, less abrasive, and relatively angst-free. Not sure when they suddenly became all moody. 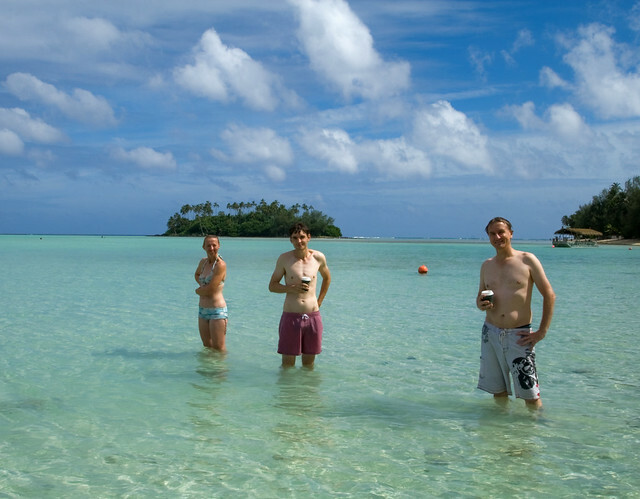 The Klomps band promo shot on Muri Beach, on the east side of Rarotonga, in the Cook Islands. Sue, Mike and Nick are not really a band. That was a joke. But it looks like a band promo shot, don&apos;t you think? Go to the usage examples of Indie pop to see it in context! This page was last modified on 3 July 2017.